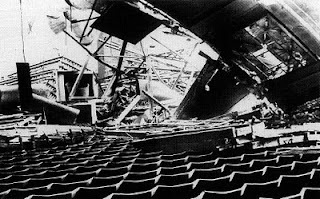 'The prettiest open-air boxing arena in the world' was how Boxing (forerunner to today's Boxing News) described the Alcazar, Edmonton, a leading London fight arena of the 1920s and '30s devastated in 1940 by a Luftwaffe bomb. 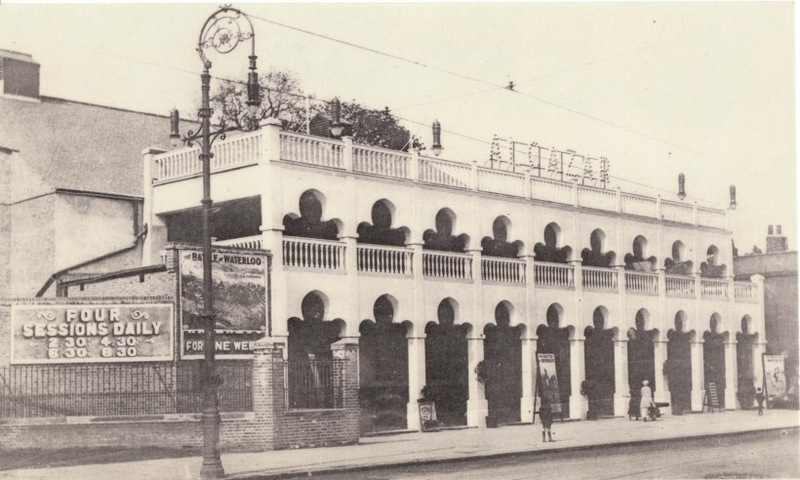 Opened on 28 June 1913, the Alcazar was a cinema sited on the west side of Fore Street in Edmonton, almost opposite Fairfield Road and just a few yards north of Angel Road. The building was whitewashed and alcoved to look like a Moorish palace, and in the winter boxing was held in a large ballroom behind and adjoining it. What made the venue exceptional, however, were the picturesque gardens behind the cinema. When the weather was warm fights were held outside in a ring that stood amid sloping grass banks, fruit trees in full bloom, flower beds and a stream. The ground was a sort of amphitheatre, bound by the stately trees in the gardens of the adjacent well-to-do houses that stretched to the railway line, which ran from Liverpool Street to Enfield Town. On balmy summer evenings thousands sat in deckchairs or on grass around the ring; their sporadic yells rivalling the roar heard up the road at White Hart Lane whenever 'Spurs scored a goal. As daylight faded, the gardens were lit up by countless coloured fairy lamps, which gave the shows a special ambience. Outdoor fights were usually advertised with the proviso 'In Hall if Wet', but in the colder months all fights were held indoors. Boxing began at the Alcazar on 19 January 1914 under George Moore, a decent former fighter and veteran of over 100 pro bouts, who promoted there in partnership with a certain Alf Barnard. There were just six Alcazar shows for Moore and Barnard; the last on 4 May that year, two months before the start of the Great War. 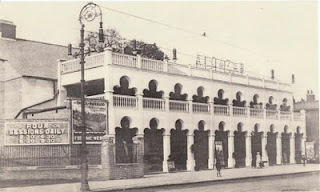 The venue was billed for its 1914 shows as the 'Alcazar dancing hall', so it's likely the gardens behind the cinema weren't then used for boxing. 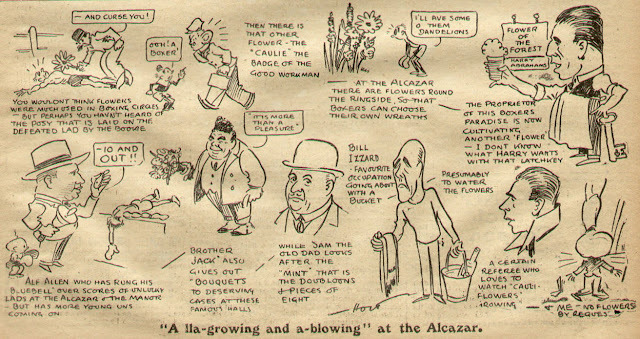 After a 10-year absence, the Alcazar reopened its doors to boxing on 2 February 1925, when Harry Abrahams, another ex-pro, staged a show in the venue's rear gardens. The unique setting proved an instant hit with fans and Abrahams was soon putting on shows at 'The Alc' – as fight fans Christened the venue – every Monday night. With Harry as promoter, referee and matchmaker, and his brother Jack acting as MC, Alcazar fight nights were a family affair. They continued with success for over 10 years, with the last boxing event staged at the Alcazar on 3 June 1935. 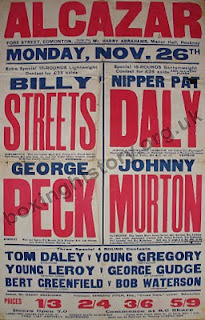 Afterwards Edmonton boxing moved to the Town Hall Baths, which staged its last show on 8 March 1937. It was almost 50 years before pro boxing returned to Edmonton, with a show at Pickett's Lock Stadium on 30 April 1986. On the bill were WBC light-heavyweight champion Dennis Andries and former WBA heavyweight champion Greg Page. The Alcazar was one of Britain's top inter-war fight arenas, and it brought some of the country's – indeed the world's – leading fighters to Edmonton. Future world middleweight champion Marcel Thil of France boxed at the Alcazar at least six times during the late 1920s, while other great names who appeared there include Harry Corbett, Alf Mancini, Archie Sexton, Andy Newton, George Rose, George Odwell, Len Wickwar, brothers Sonny and Billy Bird and boxing wonderboy Nipper Pat Daly. Sadly, in the early hours of 23 August 1940 the Alcazar was hit by a German bomb, which destroyed the ballroom and one wall of the cinema, causing the roof to collapse. This was 15 days prior to the first major raid on Britain, so the Alcazar was one of the first casualties of Luftwaffe bombing. Its sudden reduction to rubble, therefore, must have shocked local residents all the more. What remained of the building had to be demolished, and the site stood derelict until the 1960s, when the local council built a parade of shops where the cinema had stood, and houses on the grounds at the rear which had once held the boxing arena. Though I suspect most of the people who attended fight shows at the Alcazar have long since departed, it's just possible that they passed on some of their experiences to friends or family members. If you've got a story about the Alcazar's boxing days, please do post us a comment – we'd love to hear from you. I am trying to find out a bit more about my grandfather. Known as Kid Shepherd, he boxed regular at the Alcazar before the war, after boxing in fairgound booths. 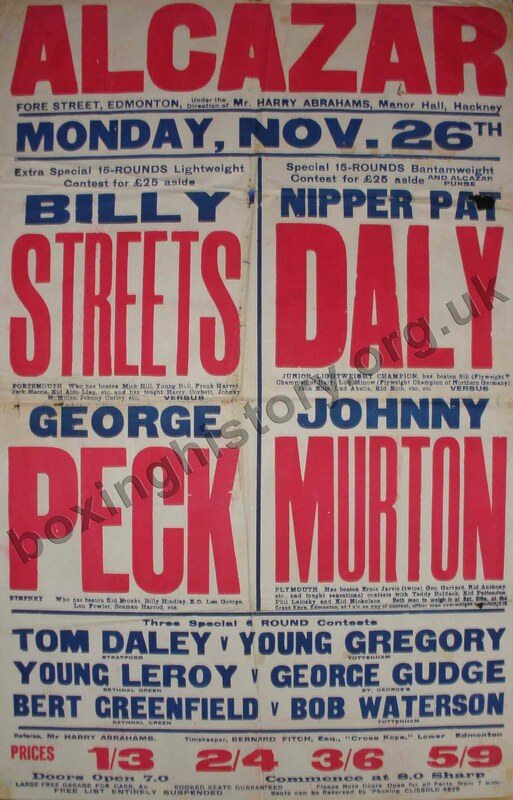 He was an ex-miner from the Rhondda Valley in Wales and left after the General Strike in 1926, to make a living in the booths before moving to Enfield N. London and boxing at the Alcazar. He was rumoured to have fought Tommy Farr, but that is a little hazy. Does anybody have any info or where I should research. It says Kid Sheppard from Blaengwynfi had 29 recorded fights in the 1920s to 1930s. And Arnold Kid Sheppard from Ferndale had 330 recorded fights in the 1920s to 1930s. I guess they're one and the same, making a jaw-shattering 359 recorded fights. Go Kid Go! My granddad boxed at the Alcazar, and was later a second there.His name was Bill Roker.He also got shot in the legs on Tottenham marshes trying to stop the two Russians in the Tottenham outrage.